The Russian circus bear has suffered a setback. According to the Associated Press, "The Unian news agency quoted Russian Foreign Ministry spokesman Alexander Yakovenko as saying Friday that Moscow regarded a potential revote favorably, an apparent significant retreat from its earlier insistence that the Nov. 21 elections were fair and valid." This reversal could not have happened without the bravery of protesters in Kyiv and the important Diaspora voices raised in support of them. There is much work ahead in maintaining pressure on the world's democracies to remain actively involved in Europe's second largest nation. So far democracies are not acting because they believe it is the right thing to do. They are engaged because they fear the turmoil and instability if there is a civil war or if Russia is able to exploit one of Europe's potentially richest nations. Do not be lulled into believing that they have Ukraine's best interests at heart. A Russian dominated Ukraine places their security at risk. They should always be reminded of this reality. If there is another election, President George W. Bush, leader of the free world, must advise his "friend" President Putin, a former KGB official, not to electioneer in Ukraine. This should include a warning that media reporting is to be without the influence of Moscow. Reporting must be fair and balanced. A democracy cannot thrive without a free, open press. Previously, much of the media had offered a biased Russian perspective on the election. Americans of Ukrainian heritage must continue to call, write, and email the White House with that message as well as members of Congress. Similarly, citizens of Canada, Australia, and other democratic nations around the world need to urge their leaders to do the same regarding Putin. This is especially important as rumors circulate that Russian Special Forces may be sent to destroy Ukrainian liberty. And in light of the growing speculation that portions of Eastern Ukraine will join Russia, western democracies must be vigilant in their opposition to the country's breakup. On November 26, 2004, an editorial in the Wall Street Journal observed: "The incoming Secretary of State, Condoleezza Rice, is a Russian expert and an architect of Mr. Bush's pro-Putin tilt. It's entirely possible that the U.S. unwillingness to say much about the Russian's increasingly autocratic behavior has only encouraged him and his Ukrainian allies to believe they could get away with their election theft. Ms. Rice and the President have to make clear to their friends in the Kremlin, as much as to the Ukrainian people, that a slide back to dictatorship is unacceptable." One of the most conservative newspapers alluded to what this writer wrote more directly in an earlier editorial: the Bush Administration has ignored Ukraine and left it to deal with Russian expansionism on its own. Freedom cannot absorb any more needless missteps. Incidentally, let's be honest. The Bush Administration followed Europe, Canada, and Australia's lead that the last Ukrainian presidential election was a fraud. America did not show the leadership needed at the early stage of this crisis. The United States, however, is now in a unique position to play a key role in containing Russian imperialism and furthering democracy. According to Paul Quinn-Judge and Yuri Zarakhovich writing for the December 6th issue of Time Magazine, "Bush was willing to give Putin a free hand in what Russia calls the 'near abroad,' the states that spun off from the broken Soviet Union. At the same time, Bush has made encouraging democracy around the world a central pillar of his presidency. In Ukraine, those two policies clash mightily. Washington spent much of Ukraine's bitterly fought presidential campaign studiously avoiding confrontation with Putin, and stuck to that line in the early days after the vote." Hopefully, President Bush has learned his lesson. Political pressure must be maintained. Ukraine is in a crisis because of the pro-Putin relationship America had with Russia. It is politically naive to think that Bush will do the right thing because his democratic principles call him to do it. Bush-democracy is a selective application. The spotlight on Russian imperialism must be brighter if there is to be the slightest chance that truth, fairness, and justice is to prevail in Europe's second largest nation. The democratic world must treat Russia for what it is, an unwanted oppressive dancing bear pushing its nose under the Ukrainian liberty tent. Diaspora Ukrainians must continue to support the efforts of the patriots in Kyiv with pressure on elected officials in their respective countries. Although there is a growing expectation of another election, it will be for naught if the world's democracies do not have on sight monitoring and involvement. The Rt. Rev. 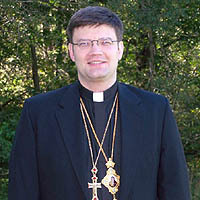 Paul Peter Jesep is an auxiliary Bishop in the Ukrainian Autocephalous Orthodox Church of North and South America Sobornopravna. He is a lawyer and political scientist by training and once worked for U.S. Senator Susan Collins (R-ME). His Grace has studied at Bangor Theological Seminary (bts.org), the third oldest such school in the United States. The views expressed here are strictly personal. Bishop Jesep may be reached at VladykaPaulPeter(at)aol.com.